What's a summer road trip without great company? Jimmy Giggle, Hoot and Hootabelle are coming your way for a live stage adventure, with their friends the Bananas in Pyjamas and Hoopla Doopla's Zap, Mimi and Jango. Starring in the live children's show of the year, Giggle and Hoot and Friends is a 50-minute stage spectacular with everyone's favourite songs, and dancing and fun. Jimmy even told me that he truly loves "The Funky Owl"; it's sure to be included. Find out more in my interview below. Giggle and Hoot, the multi-award winning and much loved ABC4Kids preschool program, focuses on preschoolers' lives and routines through songs, stories, friendship, laughter and imagination. The live show, incorporating these themes, is said to be one of the most anticipated and hottest tickets for families this summer. What's your favourite TV show [on ABC4Kids]? JG: The Octonauts… Explore Rescue Protect! 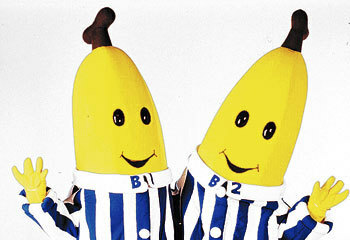 No wait, Bananas in Pyjamas! Hang on, Sesame Street, Ben and Holly's Little Kingdom… Oh I love them all! JG: The Giggle Galaxy; we all love going to space! JG: Definitely not worm flavoured milkshakes! I prefer banana milkshakes… Mmmm! JG: Well I am 150 years old; does that make me a grown up? JG: I sure do. I play the guitar, trumpet, triangle, the owl-napophone, the harmonica, drums, bass guitar, double bass, saxophone, banjo, and of course the chest of drawers piano. JG: I play lots and lots of Hootball and hours and hours of Hoot and Seek! Those owls are very good at hiding. Who's your favourite footy team? JG: I love the red and black! Go the Bombers. DC: What's the weirdest thing a fan has ever asked you? JR: If I was a puppet. I responded, "If I'm a puppet then where is my puppeteer?" The look on his face was priceless. DC: What's your best advice to kids (or others) that are aspiring actors? JR: Go for it. It's a funny old industry, but if you believe there is something out there for you, then there probably is. So keep the dream alive, it will pay off eventually. DC: How do you think becoming a Dad will impact your career? JR: I believe that you can't really understand something until you are doing it, so I will most definitely have a new found appreciation for all the parents out there. As for a change, that new appreciation will have a positive impact I'm sure. My wife has already said that Giggle and Hoot will be on all the time, I could try out my jokes on the little one first. Haha! DC: Will you watch yourself on ABC4Kids with your kid(s)? JR: I don't like to watch all that often, but you have to keep an eye on it to improve, and know what works and what doesn't. I'm sure it will be on though, the ABC is the best viewing for preschoolers; I admire the ABC for their passion to deliver premier shows with such variety to the programming. DC: What do you love most and least about touring live? And about recording season? JR: I do a lot of travel, which has its draw backs, possibly more so in the future with the new bub. That said, I am lucky enough to travel around the country and perform to Giggle and Hoot fans. A huge reward is seeing those smiling faces both in the crowd and up close and personal. Another amazing honour that I have being Jimmy Giggle, is visiting kids who are restricted to a hospital bed. It's emotional, but a privilege that I never thought I would have. To bring all they love about the show into their little world is amazing. DC: If you never did the funky owl again, would it be too soon? Do you love or hate the Funky Owl, c'mon tell the truth. JR: Honestly, I love the Funky Owl, I think it is hilarious. It's full of energy, and so am I! Ask me again in 12 months when it has been on everyday though; could be a different answer altogether. DC: Do you feel like Jimmy Giggle has typecast James Rees? What does the future hold for James Rees? JR: I don't think so; Jimmy Giggle is an extension of myself, but greatly different at the same time. I have a whole lot more to offer in different areas that I would love to explore in the future. I was in a pantomime with Magda Szubanski (Snow White Winter Family Musical) in July this year, playing Muddles, which was awesome. But for now I am having the best time Giggling every day! Click here for some fun print-and-colour-in pages, and other fun and games on ABC4Kids.net.au.